Figure 4-29. - Planetary gearset. A planetary gearset (fig. 4-29) consists of three members-sun gear, ring gear, and planetary carrier which holds the planetary gears in proper relation with the sun and ring gear. The planetary gears are free to rotate on their own axis while they "walk" around the sun gear or inside the ring gear. Reduce output speed and increase torque (gear reduction). Increase output speed while reducing torque (overdrive). Reverse output direction (reverse gear). Serve as a solid unit to transfer power (one to one ratio). Freewheel to stop power flow (park or neutral). 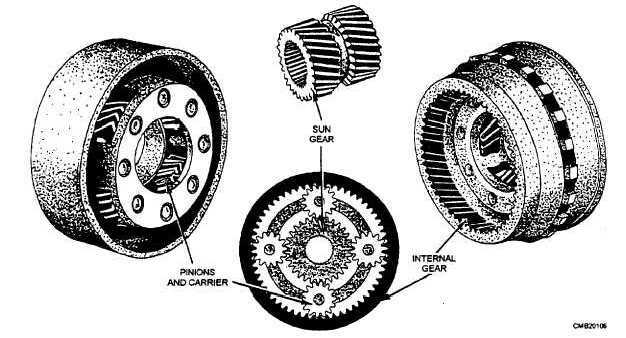 Figure 4-30 shows the simplest application of planetary gears in a transmission. With the application shown, two forward speeds and neutral are possible. High gear or direct drive is shown. 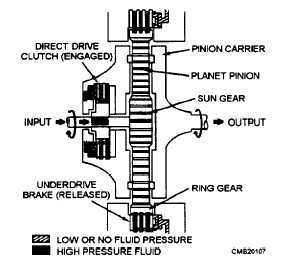 The clutch is holding the planet carrier to the input shaft, causing the carrier and sun gear to rotate as a single unit. With the clutch released, all gears are free to rotate and no power is transmitted to the output shaft. In neutral, the planetary carrier remains stationary while the pinion gears rotate on their axis and turn the ring gear. Should the brake be engaged on the ring gear, the sun gear causes the planetary gears to walk around the inside of the ring gear and force the planet carrier to rotate in the same direction as the sun gear, but at a slower speed (low gear). To provide additional speed ranges or a reverse, you must add other planetary gearsets to this transmission. Figure 4-30. - Simple planetary gear application.